Branch Chain Amino Acid supplements are usually marketed as a muscle-building sports nutrition supplement. Another thing they seem to be helpful for is fat loss. This article details how BCAAs may be able to help when you are dieting and training to look your best. First, the research. One study using collegiate wrestlers as subjects finds that supplementing with BCAAs enabled them to lose significantly more body fat than subjects who only ate less to lose weight (1). The subjects taking BCAAs also lost significantly more fat from their abdomen, which as you may know is a common problem area in terms of body fat accumulation. Many prominent strength coaches and nutritionists such as John Berardi, Chad Waterbury, and Charles Poliquin say that they find BCAAs can benefit people who are cutting calories and working out to get rid of excess body fat. The amount of BCAAs you should take to help you with your weight loss plan will vary depending on how many calories you are eating, your protein intake, workout schedule, etc. Studies show that you need to get between 8-16 grams of leucine, one of the 3 branch chain aminos every day to just meet your body’s muscle building and other needs (2). BCAA supplements can help ensure you get this amount daily, even when you are eating less to lose weight. You may find you need to take more or less. It’s probably best to take BCAAs on an empty stomach. This limits their competition with other amino acids so they can be best utilized by your body. We find that between meals and before and after a workout are the best times to take BCAAs. If you use, or are considering using a BCAA supplement we recommend you choose a product that requires you to take as few capsules as necessary to get your desired dose. One product we like is Optimum Nutrition BCAAs. Each 2 capsule serving provides 1 gram of BCAAs. You can buy it in 200 and 400 capsule sizes. If taking several capsules a day is not something you want to do, you can buy a powdered BCAAs to mix into with a drink. Optimum BCAA 5000 is a branched chain amino acid powder that we like as each serving provides 5 grams of BCAAs, its tasteless and mixes instantly in water. 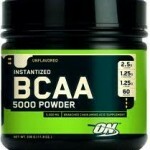 Click here to buy Optimum Nutrition BCAAs from the Stayfitcentral.com store. Click here to buy Optimum BCAA 5000 from the Stayfitcentral.com online store.